Give day old bread new life by transforming it into bread pudding. It is a classic comfort food that can be prepared with French bread, a crusty Italian loaf, or even more delicate challah or brioche bread. Experiment with your favorite to give the dish your own signature twist. This rich and indulgent chocolate bread pudding is the definition of decadence. The recipe calls for readily available semi-sweet chocolate chips, but you can feel free to use any of your favorite high-quality chocolate bars or morsels in the dish. While the bread pudding is baking in the oven, prepare the warm chocolate sauce. Ribbons of liquid chocolate are the crowning glory to this chocolate bread pudding recipe. It is incredible how simply whisking together warmed cream with more chocolate can take an already stunning dish to a whole new level. I suggest serving the chocolate sauce in a pourable container and passing it around the table to allow everyone the chance to add just the right amount for their palate. If you want to add a splash of color for serving, offer your guests a bowl of sliced fresh strawberries or raspberries to complement the dessert. Because this is such a rich dessert, one 9 x 13 pan is enough to serve a crowd of 10-12 guests. It is the perfect easy yet impressive recipe to bake for a special occasion or family gathering. Butter a 9- x 13-inch baking dish. Preheat the oven to 350 F.
In a medium heavy saucepan combine 3 cups of cream, milk, and sugar over medium heat. Bring to a simmer, stirring until the sugar dissolves. Remove the pan from the heat. Add 10 ounces of the chocolate chips and whisk until melted and smooth. In a large bowl whisk the yolks and eggs. Gradually whisk in the warm cream and chocolate mixture. Add the bread and stir until coated. Let stand for about 5 minutes, until the bread is very soft. Transfer the bread mixture to the prepared dish. Cover with foil. Bake for 45 minutes. Remove the foil and bake for about 15 minutes until the pudding is golden brown and set. Cool slightly on a rack. Make the sauce. In a small, heavy saucepan bring 1 cup of cream to a boil. Remove the pan from the heat. Add the remaining 8 ounces of chocolate chips and whisk until melted and the sauce is smooth. 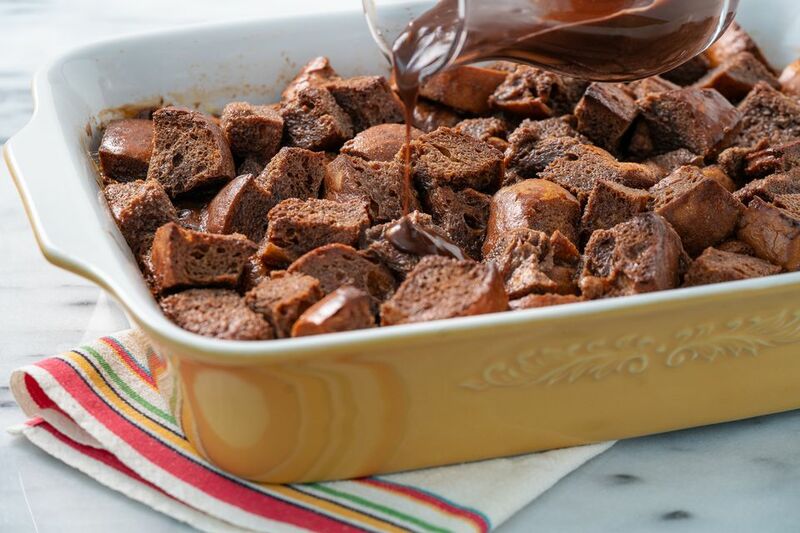 Serve the chocolate bread pudding warm with a drizzle of the warm chocolate sauce.